Dog owners know how difficult it is to remove the burrs from the coat and skin of their little furry friends. Burrs or the burdocks are the prickly seeds that are found on plants and can stick anywhere on your dog’s body even to any other pet’s body if the burr comes in contact with it. These burrs are very difficult to remove and can cause a lot of pain to your dogs if not removed with utmost patience and care. It is essential to remove these burrs or else it can cause infection as it becomes embedded in the skin. The most prominent places where you can spot the burrs on the dog’s body is in their fur, coat, near eyes, behind ears, etc. In short, all the areas that are exposed is an easy target for the burrs to stick. You should pay attention to your dog’s skin and make it a point to examine all the possible areas where there are chances of getting burrs weekly. 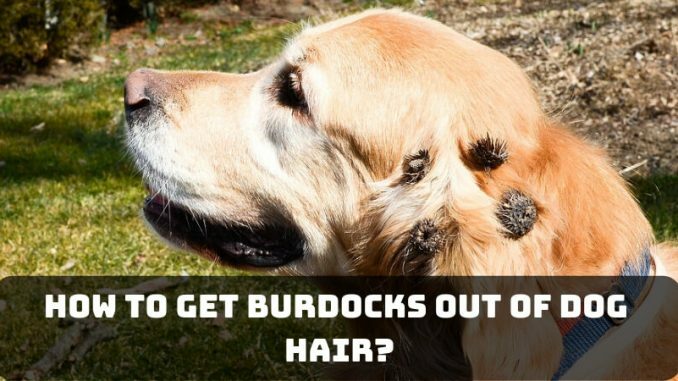 How to Get Burdocks Out of Dog Hair? Take out all the loose burrs and run your hand through the dog’s skin to find if there are any burrs in the coat. If the burrs are loose, it will be easy to remove it from the hand only. Once the loose burrs are out, take a comb and start combing the furr and see to it that there are no knots in the furr. Take the metal comb that has wide tooth so that it holds the burr with the help of it. Now take a pair of scissors that are mainly for grooming dogs and then cut the burr along with fur so that it doesn’t hurt the skin of the dog and your pet is saved from the pain. There are many burrs on the body that can be pressed by the hand to break it off into smaller pieces and then get rid of the burrs by combing and cutting the burr if required. You can also shave the burr off if your dog has a long overcoat with the help of a comb. The pliers can be used to cut the burrs also followed by removing it. Make sure that while combing you are not applying a lot of force because this will cause pain to the dogs. It is suggested to wear gloves while getting the burrs out of the dog’s skin so that it doesn’t prick or harm you. Some people also suggest using a lubricating substance such as vegetable oil, mineral oil to loosen the hair of the dog’s coat so that it becomes easy to remove the burrs from their coat. You can also use aloe vera gel for loosening up the hair as this will make the process of removing burrs less painful and more comfortable. You need a small amount of oil to lubricate the surface and make sure you get rid of the oil after removing burrs by giving a bath to your pet. If the burrs are very difficult to get rid of, then take your dogs to the professional groomers as there are some instances where the burrs are near the eye area or nose which becomes very difficult to remove. All these steps will help you in making sure that there are no burrs on your dog for making sure that they are protected from the burrs. Keep checking the fingertips and paws of your dogs to see if there are burrs. You can also get the gloves for the dogs when they are going outdoors. Make it a weekly task to check and remove the burrs before it becomes robust and embedded in the skin. I hope this article helps you in making your furry friend burr free!